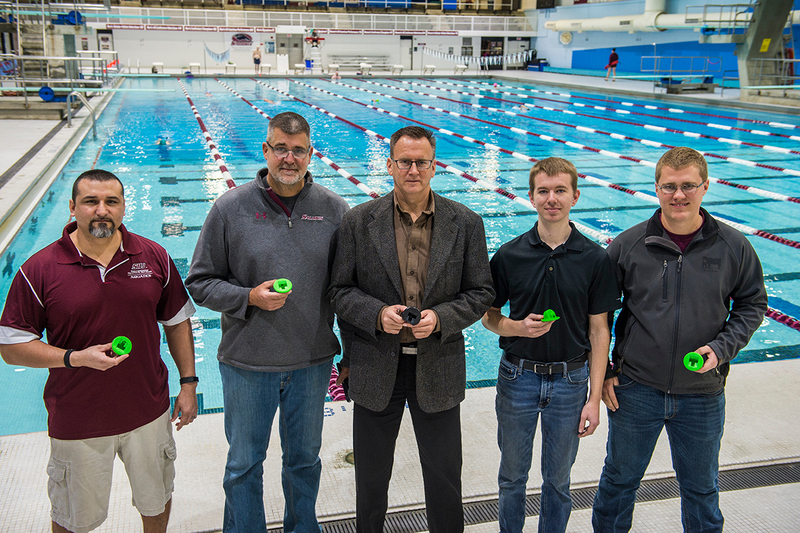 Those involved in the project to create new 3D pool arts include, left to right: Jamison “Trigger” Tryggestad, swimming pool tender; Jeff Goelz, assistant director of facilities for SIU’s Recreational Sports and Services; Bruce DeRuntz, technology professor/Robotics Club sponsor; and the two students who actually created the new parts – Nick Sjoberg and Kyle Wente. As a result, SIU’s Olympic-size Student Recreation Center swimming pool, used daily by an average of 300-plus people, can be used as intended for many years to come. 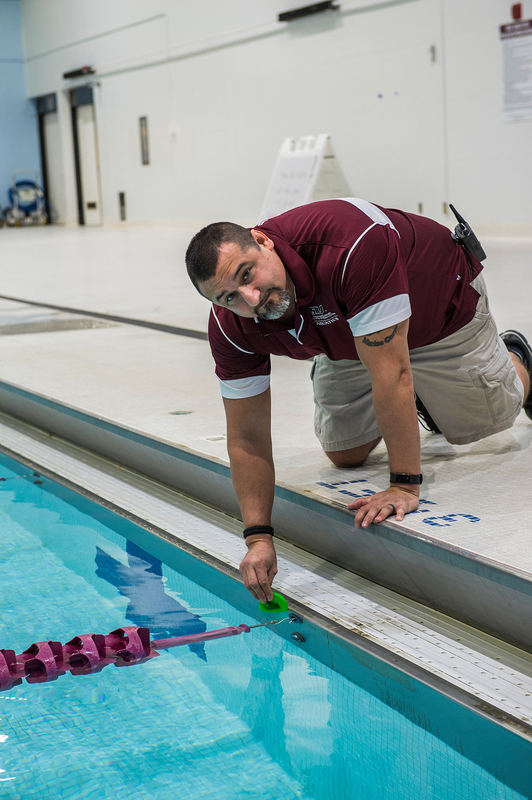 Built in 1977, the 880,000 gallon, 50-meter by 25-yard pool has been carefully maintained so both the pool and deck are in good condition, according to Jeff Goelz, assistant director of facilities for SIU’s Recreational Sports and Services. He said Jamison “Trigger” Tryggestad, swimming pool tender, takes great pride in his work and it shows. Jamison “Trigger” Tryggestad, SIU swimming pool tender, demonstrates installation of one of the new 3D printed cup anchors. But, after more than four decades of constant use, some parts simply wear out and break. Several years ago the cup anchors that hold the lane lines in place began to break. At that time, Goelz learned the manufacturer had gone out of business. So, he bought all of the anchors he could find. However, two more anchors have broken in recent months and the stockpile is long gone. Revising the pool lane system could prove quite costly. Goelz talked to Bruce DeRuntz, a professor in the technology degree program, about the situation. “He agreed to help me with an ingenious solution,” Goelz said. Enter Nick Sjoberg, of Huntley, and Kyle Wente, of Teutopolis. Sjoberg is a first-year graduate student in workforce education who earned his bachelor’s degree in electrical engineering at SIU in May and Wente is a senior mechanical engineering student. They and DeRuntz thought they could use a 3D printer to recreate the cup anchors. So, they went about engineering a solution. Wente is the design captain for the campus SAE (Society of Automotive Engineers) Saluki Baja team and both students are members. The team designs, builds, tests and races a new mini-Baja car each year. Sjoberg is also member of SIU’s award-winning Robotics Club, of which DeRuntz is the faculty adviser. The two carefully measured and calculated, creating exact specifications and then utilizing Autodesk Inventor to make an intricate 3D computer model for the pool anchor replacement part. Then they used a 3D printer to turn a thin green filament into a replica of the original part, albeit green instead of black. Next came the finishing work, smoothing edges and using a reamer to make the cutouts the exact size they need to be. All told, from design to construction to finishing, it took them about 7-8 hours to complete the first anchor. Making subsequent pool pieces took half as long since the design work was already done. 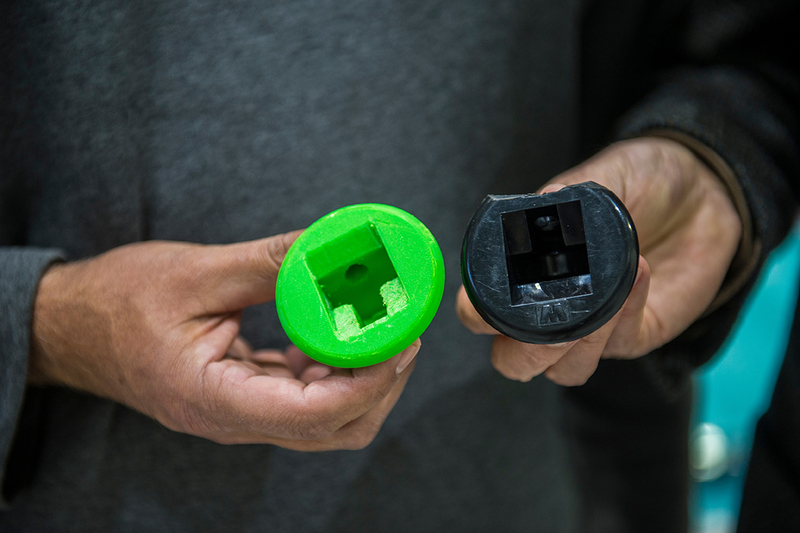 Close-up photo of the new cup anchor, created using 3-D printing by SIU students, showing the lines where the plastic filament comes together to create the part. Wente and Sjoberg utilized mechanical engineering, manufacturing and electronics expertise and skills to complete the various phases of the project. They’ve previously worked on team/club projects such as a Mario Kart, remote control cars, robots and more, but they were excited to be involved in something that would have a real and noticeable impact on the campus. The cost for crafting the new parts in-house was quite minimal, since Wente and Sjoberg volunteered their time and the $800 printer was already on site in the technology department. “We probably only used $3-4 in materials for each piece,” Wente said. 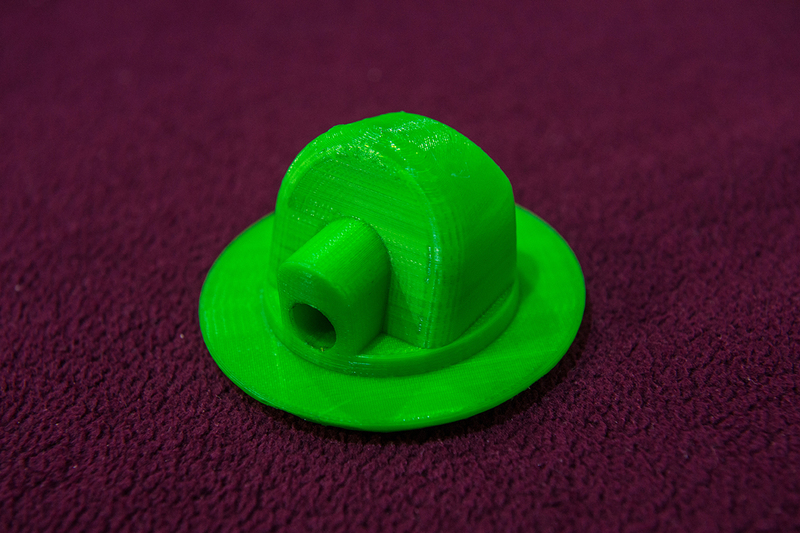 The green cup anchor, created by SIU students using a 3D printer alongside one of the old, broken cup anchors for the pool. DeRuntz said he’s very happy that Goelz contacted him about the pool problem and pleased his students were able to come to the rescue. While 3D printing actually traces its roots to the military in the 1980s, it’s become a booming industry, Sjoberg notes. Being able to use various types of technology and gaining practical experience is a great boost for their resumes and career preparation, the students said. In fact, Wente already has a job waiting for him when he graduates in May. He’ll be a manufacturing engineer for IHI Turbo America, a growing Shelbyville company whose products include the Hellcat and Demon superchargers as well as turbochargers for other brands. Sjoberg’s career goal after graduation is to work in a teaching lab or a makerspace, “helping students learn how to do cool stuff like this,” he said.